In some circumstances, a creatinine check at home instead of a complete clinical control could be sufficient for patients with renal disease. Home monitoring of serum creatinine concentrations could, for instance, be useful during insecure periods after kidney transplantation, or to keep a close watch on possible disease recurrences. Below we describe a pediatric case of recurrent hemolytic-uremic syndrome (HUS), in which we would have liked to monitor creatinine levels at home in order to restrict the number of hospital visits. Point-of-care testing (POCT) for creatinine concentrations offers the advantage of providing a result within minutes outside the hospital, which potentially enables faster diagnosis and management of HUS and other conditions threatening kidney function. Obviously, POCT devices employed at home must be easy to use in daily practice by the patient or his/her parents. Therefore, it was considered essential that tests could be carried out with a small volume of capillary blood. Notably, POCT systems used at home should produce results comparable to reference testing in the laboratory. To that purpose, we evaluated two different POCT systems for creatinine measurement (Roche Reflotron Plus and Abbott i-STAT) versus the routine test used in the laboratory of the Erasmus MC-Sophia Children�s Hospital, in 20 children displaying an extensive range of creatinine blood values. Children with atypical HUS have frequently been referred to the pediatric clinic in Rotterdam. This syndrome is characterised by microangiopathic hemolytic anemia, thrombocytopenia, and renal failure (1). A representative case described below gave rise to the present data. At the age of four months, a boy presented with atypical HUS for the first time. Plasma exchange resulted in temporary clinical improvement, but the HUS recurred after a few months, and plasmapheresis could not prevent him from progression to end-stage renal failure. Peritoneal dialysis was started, yet after two years this was switched to hemodialysis due to a devastating peritonitis. Bilateral nephrectomy was performed at four years of age because of therapy-resistant hypertension. Finding a suitable deceased kidney donor was difficult due to the patient�s homozygosity on HLA-A, -B and -DR alleles. At the age of five years, the boy received an adult deceased donor kidney graft. Post-transplant, serum creatinine values quickly normalised to circa 25 �mol/L (see Figure 13.1.). Ten days post-transplant he showed perforation of the colon ascendens, for which a temporary stoma was applied. One month post-transplant, an acute rejection occurred, which was successfully treated with methylprednisolone. Subsequently, with monthly intervals, two episodes of bacterial gastroenteritis with increased serum creatinine concentrations due to dehydration, and a primo Epstein-Barr virus infection occurred. A quiet period of ten months ensued. At the age of 6 1/2 years the patient displayed a sudden increase in serum creatinine concentration, along with hematuria. A graft biopsy was suspect for recurrence of HUS. The boy was treated by plasma exchange, daily during the first two weeks, followed by tapering in frequency, and after three months he was switched to weekly plasma infusions. During this treatment, serum creatinine values suddenly deteriorated, after which hemodialysis was restarted. Figure 13.1. Case history: patient serum creatinine concentrations in time. Each data point represents a single serum creatinine concentration obtained by routine laboratory measurement (Y-axis) at the age indicated (X-axis). Bold horizontal lines represent the reference range. At seven years of age, a second transplantation was performed using a kidney from the patient�s mother. After problems with urinary drainage followed by reimplantation of the graft ureter, serum creatinine concentration settled at about 120 �mol/L. However, eleven months post-transplant another sudden, biopsy-proven recurrence of HUS occurred, with a rise in serum creatinine to approximately 700 �mol/L. Daily plasma exchanges resulted in reversal of the creatinine concentration to pre-recurrence level, and the frequency was very slowly tapered to twice every week. Two further episodes of rising serum creatinine concentration were seen, due to gastroenteritis and dehydration. Ideally, the patient would have been checked by the physician on an almost daily basis. However, as the boy lived at a distance of about 50 km from our clinic and went to school normally, this was not feasible for him and his parents. To save the family anxiety and several trips to the hospital, we intended to optimise care by checking the boy�s blood creatinine value at home. We randomly included 20 outpatients of the Division of Pediatric Nephrology and dialysis patients, aged two months to 17.8 years, with varying creatinine serum levels. The parents were informed about the study and granted informed consent, provided that children resisting additional finger pricking would not be enrolled. In addition, samples were taken from six healthy adult volunteers, in order to obtain creatinine concentrations in the normal range. Capillary blood for regular laboratory testing and for the two point-of-care tests was collected at the same time. Collection of capillary blood was performed according to the NCCLS protocol (2). Blood was collected in heparinised capillaries and immediately used to perform the Reflotron Creatinine and i-STAT Creatinine/Crea tests. Another 400 �L of blood was drawn into a heparin microtainer. Subsequently, tubes were centrifuged and plasma was stored at room temperature for up to one hour until routine creatinine measurement. The primary outcome measure was the difference between the creatinine concentration obtained by the routine automated assay (reference test) and creatinine POCT, in �mol/L. In addition, ease of use in daily practice was extensively assessed. The Reflotron and i-STAT test were performed near the patient, whereas the routine assay was carried out in the laboratory. The Reflotron Plus (Roche Diagnostics, Almere, The Netherlands) is a table model diagnostic POCT device working on the principle of reflectance photometry with approximate dimensions 21 � 30 � 35 cm, which uses reagent strips to measure a variety of clinical chemistry parameters. For the Reflotron creatinine test, 32 �L of whole blood was collected in a dedicated lithium heparine capillary to determine the creatinine concentration in �mol/L using a Reflotron Test Creatinine strip (Roche Diagnostics, Almere, The Netherlands) on the Reflotron Plus apparatus. The i-STAT (Abbott Point-of-Care, Hoofddorp, The Netherlands) is a hand-held diagnostic analyser of approximate dimensions 5 � 6 � 21 cm, which uses cartridges to perform a range of clinical chemistry tests. In our hands, the i-STAT creatinine test required a minimum volume of 65 �L. Therefore, 125-�L heparinised capillaries were used to collect whole blood for the enzymatic amperometric measurement of the creatinine concentration (in �mol/L) employing the i-STAT device with Creatinine/Crea cartridges (Abbott Point-of-Care, Hoofddorp, The Netherlands). Two highly qualified laboratory technicians of the Department of Clinical Chemistry, who were blinded to the results of the routine test, performed all POCT measurements. For the routine automated creatinine test, the enzymatic colorimetric CREA plus assay (which has been calibrated against HPLC) was performed on plasma in the Hitachi 912 analyser (Roche Diagnostics, Penzberg, Germany). The linear association between the results from the near-patient creatinine tests and the routine test was analysed employing Pearson�s correlation coefficient. The differences between the POCT and the reference creatinine concentrations were analysed using the methods of Bland and Altman (3) and Passing and Bablok (4). Over the concentration range between 50 and 500 �mol/L, creatinine POCT was considered clinically valid when values did not differ from the results of the routine test by more than 20 �mol/L (see below), at a biological within-subject coefficient of variation of 4.3% (5). For all patients, parental consent was given. Additional finger pricking was resisted by none of the patients, and sufficient material could be obtained from all of them. Reflotron, i-STAT and routine creatinine measurements were available for 20 children and six healthy adult volunteers. For the 20 children enrolled, the median age was 14.8 years (range, 0.2-17.8). Ten patients (50%) were male and ten (50%) were female. The median age for the boys and the girls was 14.6 years (range, 0.2-17.8) and 14.8 years (range, 6.8-17.7), respectively. For the Reflotron and i-STAT test, the correlation coefficient versus the routine automated Hitachi 912 creatinine test was 0.99 and 1.00, respectively. The Reflotron test generally produced lower creatinine values than the routine test, both overall and for the two outliers displaying a difference > 50 �mol/L (109 versus 167 and 167 versus 246 �mol/L) in the creatinine concentration range < 500 �mol/L (Bland-Altman plot, see Figure 13.2.A). The overall mean difference between Reflotron and routine creatinine measurement was -16 �mol/L (n=26, 95% CI -30 to -3). In the concentration range of up to 500 �mol/L and for concentrations > 500 �mol/L creatinine, the mean difference was -11 �mol/L (n=23, 95% CI -21 to -2) and -55 �mol/L (n=3, 95% CI -149 to 39), respectively. By contrast, the i-STAT test mainly generated slightly higher values in the creatinine concentration range < 500 �mol/L, with a smaller distribution as compared to the Reflotron test and no outliers showing differences > 50 �mol/L between i-STAT and Hitachi 912 creatinine values. However, above 500 �mol/L creatinine the i-STAT produced substantially lower values than the routine test (Bland-Altman plot, see Figure 13.2.B). The overall mean difference between i-STAT and routine measurement was 4 �mol/L (n=26, 95% CI -5 to 13). In the concentration range of up to 500 �mol/L and for concentrations > 500 �mol/L creatinine, the mean difference was 11 �mol/L (n=23, 95% CI 6 to 15) and -52 �mol/L (n=3, 95% CI -68 to -35), respectively. With regard to the Reflotron test, 16 out of 26 results (62%) fell within � 20 �mol/L of the routine test results. In the creatinine concentration range above 500 �mol/L, three values were outside this window: differences between Reflotron and routine measurement were -138, -54 and 28 �mol/L. In the creatinine concentration range below 500 �mol/L, the maximum difference was surpassed for 7 out of 23 (30%) pairs of data, with deviations between -79 and 41 �mol/L. With regard to the i-STAT test, 20 out of 26 (77%) of the results fell within � 20 �mol/L of the routine test results. In parallel to the Reflotron data, three values were also outside this window in the creatinine concentration range above 500 �mol/L: differences between i-STAT and routine measurement were -61, -59 and -35 �mol/L. In the concentration range below 500 �mol/L, the maximum difference was surpassed for 3 out of 23 (13%) pairs of data, with deviations of 21, 24 and 40 �mol/L. When Reflotron and Hitachi 912 test were compared according to Passing and Bablok (4), the slope was 0.95 (95% CI 0.87 to 1.06), and the intercept was -2.8 (95% CI -13.5 to 7.4; y = 0.95x - 2.8). When the i-STAT and Hitachi 912 test were compared, the slope was 0.96 (95% CI 0.90 to 1.00), and the intercept was 16.3 (95% CI 9.2 to 24.6; y = 0.96x + 16.3), indicating a constant bias. P-values from cusum tests for linearity were > 0.1. Figure 13.2. 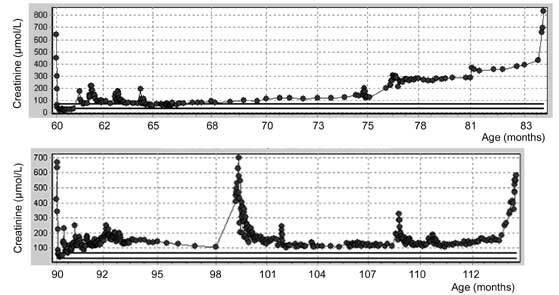 Bland-Altman comparison plots of creatinine concentrations measured by (A) the Roche Reflotron versus the Hitachi 912 routine automated test, and (B) the Abbott i-STAT versus the Hitachi 912 test. A dotted horizontal line represents the mean difference between the values obtained by either POCT system and the routine test, and the bold solid horizontal lines represent a -20 �mol/L and 20 �mol/L difference. Next to the difference between the creatinine concentration measured by creatinine POCT and the routine test, we extensively assessed the ease of use in daily practice for both POCT systems. Although the Reflotron test required slightly less material than the i-STAT test (32 versus 65 �L whole blood, respectively), it turned out that measurement could be carried out using only a drop of blood and yielding a result within 2-3 min employing either apparatus. Obviously, we consider it essential that the intended users receive the appropriate instructions from laboratory personnel, before any POCT device can be adequately applied at home. Although the i-STAT cartridge system may require a little more training, we feel that Reflotron and i-STAT could both perform well in this situation, provided that proper instruction is given. However, the i-STAT system will be easier to use at home: as it seems to have been developed for use in smaller laboratories, it can be applied as a hand-held instrument. By contrast, the Reflotron is a table model apparatus; moreover, even in the hands of our experienced laboratory workers, air bubbles present in the blood capillary tended to be more problematic (by yielding markedly decreased creatinine values) using the Reflotron device. In the present study, two creatinine POCT devices were compared to a routinely used laboratory method for clinical use in children at risk for sudden decrease of renal function, such as those with recurrent disease, as in non-infectious HUS, or instable kidney transplant patients. In healthy children, serum creatinine concentrations are between 18 and 88 �mol/L (18-35 �mol/L between one and four years of age, 31-68 �mol/L between four and 13 years of age, and 37-88 �mol/L between 13 and 17 years of age). At a creatinine value of 500-600 �mol/L, end-stage renal failure will have been reached in all children. To detect significant changes in creatinine blood concentrations, a home monitoring device should be able to detect an increase in concentration exceeding 20 �mol/L in the range between 50 and 500 �mol/L creatinine. Both the Reflotron and the i-STAT test correlated well with the routine automated test, especially in the creatinine concentration range up to 500 �mol/L. The Bland-Altman plot for the Reflotron test demonstrates good correlation with the routine test up to a concentration of 500 �mol/L creatinine, displaying only two outliers with deviations > 50 �mol/L. However, above a concentration of 500 �mol/L, it shows a considerable increase in distribution with deviations of -138, -54 and 28 �mol/L. The Bland-Altman plot for the i-STAT test displays a smaller distribution up to a creatinine concentration of 500 �mol/L. However, the i-STAT also shows an increasing distribution above 500 �mol/L, with deviations of -61, -59 and -35 �mol/L. Both near-patient tests thus show less precise measurement of creatinine values in the highest concentration range (> 500 �mol/L). In the abovementioned clinically relevant creatinine range between 50 and 500 �mol/L, however, the maximum difference was surpassed in only 30% and 13% of cases for the Reflotron and i-STAT test, respectively. The Reflotron and i-STAT POCT creatinine tests can both be performed using only a drop of blood for measurement within 2-3 min employing either. Although we did not explicitly evaluate the use of both POCT systems outside our hospital, the use of the i-STAT test at home seems more feasible because of its greater ease of use. The i-STAT device was evaluated to everyone�s satisfaction by two inexperienced medical students at the outpatient clinic. At present, it is already frequently used for near-patient measurements in hospital settings, with the main purpose of blood gas and glucose monitoring at the Intensive Care Unit. To our knowledge, this is the first study in literature, in which a creatinine point-of-care test has been evaluated for its possible use at home. Hence, financial support has been given by the Social Policy unit of the Dutch Kidney Foundation in order to cover the reagents� expenses. Taking into account the general underestimation of creatinine values and its somewhat smaller ease of use, we feel that, although not tested in daily practice, the Reflotron test is less suitable for creatinine testing at home and more appropriate for a laboratory setting. Our eventual aim is to be provided with predictive information by measuring the patient�s blood creatinine concentration at home. Although the distribution with both POCT devices suggests that they would perform well in daily practice, it can not be ruled out that they will achieve worse when employed by less experienced users. For both systems, we therefore consider it essential that the patient and/or his/her parents receive the appropriate instructions from laboratory personnel before such devices can be adequately used at home. Regarding both the patient�s quality of life and the expenses of POCT systems versus plain routine creatinine testing, it should be considered that faster diagnosis and management of serious conditions such as HUS might be attained employing near-patient testing at home on a daily basis. The additional cost of the device plus the reagents might thus be outweighed by both the patient�s eventual benefit and the reduction in extra expenses that might have arisen otherwise (e.g., the higher cost of hospital treatment upon leaving such conditions untreated for a longer time). At the moment, patients who are suspected for changes in creatinine values have to visit the hospital for measurement of their serum creatinine concentration. A few transplant patients have learned to draw capillary blood, collect it in a microtainer and send it to the hospital by regular mail, as previously described (6). However, this takes a few days between drawing blood and test conclusion, resulting in cumbersome communication. Direct measurement at home provides a creatinine value within a few minutes, after which the result may directly be communicated to the treating physician in the hospital by email. For the patient, this may allow restriction of hospital visits and fine-tuning of his or her treatment. In conclusion, the use of point-of care creatinine tests is a promising tool for the early diagnosis and management of conditions threatening kidney function. The Roche Reflotron Plus with Creatinine strips and the Abbott i-STAT with Creatinine/Crea cartridges are good candidates for near-patient creatinine testing in blood, yet the i-STAT system seems best for physiologic monitoring at home given its greater ease of use. Early recognition and treatment of declining kidney function may lead to a better prognosis in renal patients. Besbas N, Karpman D, Landau D, Loirat C, Proesmans W, Remuzzi G, et al. A classification of hemolytic uremic syndrome and thrombotic thrombocytopenic purpura and related disorders. Kidney Int 2006;70:423-31. Clinical and Laboratory Standards Institute. Procedures and devices for the collection of diagnostic capillary blood specimens, 5th ed. Approved standard H4-A5. Wayne: NCCLS, 2004;24(21). Ric�s C, Alvarez V, Cava F, Garc�a-Lario JV, Hern�ndez A, Jim�nez CV, et al. Current databases on biological variation: pros, cons and progress. Scand J Clin Lab Invest 1999;59:491-500. Nauta J, Hop WCJ, Grose WFA, van der Heijden AJ, Kist JE, Wolff ED. Improved renal transplant monitoring in outpatient clinics. Transplantation 1989;47:715-7.